Cost to install a ceramic tile backsplash varies greatly by region (and even by zip code). Get free estimates from tile, marble and granite contractors in your city. Cost to install a ceramic tile backsplash varies greatly by region (and even by zip code). Get free estimates from tile, marble and granite contractors in your city. The average cost of installing a ceramic tile backsplash is $400 - $600​. How much does it cost to install a ceramic tile backsplash?? A ceramic backsplash is a functional and beautiful part of a kitchen. For this example, we'll look at installing a glazed ceramic tile backsplash that covers 16 square feet in the kitchen. The average cost of this project ranges between $400 and $600. It is recommended to always hire a professional for tiling projects. Ceramic tile: the backsplash 1 material averages $10-$15 per square foot, although it is possible to spend much more than that on premium ceramic backsplash 1 tiles. It is recommended to always purchase 10%-20% more extra tile in case of breakage. Total tile cost (including extra materials) for this project would be around $240. Mortar 2 adds another $75-$125, and sealer adds another $60-$100. Labor​: most tile installers charge based on the size of the space, not the time it takes. 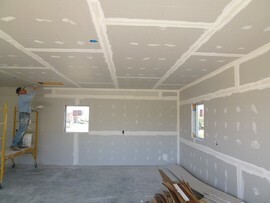 Expect to add $10 per square foot in installation costs or a total of $160. Some tile installers also charge an hourly rate of $40-$60 per hour because working in a kitchen around appliances, outlets, plumbing, and electrical can be tedious work. 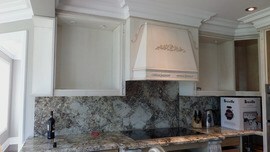 If you need old backsplash 1 removed, plan to add an extra $200-$400 to your total. If the drywall 3 behind your backsplash 1 is damaged and needs to be repaired, add an additional $150. More involved patterns, including the use of trim and decorative pieces, can increase total costs by around 15%-20%. Unglazed ceramic tiles provide more traction, but glazed tiles provide more design options and are the more popular choice. The tile prices are very similarly, but glazed tiles don't require the extra cost of protective sealant, which averages $100. Some tilers may provide discounts if you have the backsplash 1 installed at the same time you install tile countertops or remodel the entire kitchen. Talk to your contractor about available packages. Many homeowners save money by buying the tile themselves straight from a distributor or on sale. This removes the added cost of the contractor and can lead to significant savings. How much does it cost to install a ceramic tile backsplash in my city? Cost to install a ceramic tile backsplash varies greatly by region (and even by zip code). To get free estimates from local contractors, please indicate yours. Cost Considerations: Lower-grade ceramic tiles are one of the cheaper backsplash materials, at around $10 per sq. ft. Stainless steel is one of the more expensive backsplash materials, and can cost $25 per sq. 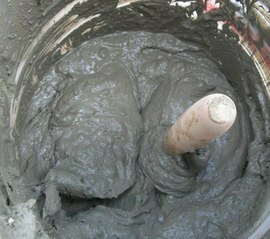 ft.
A mixture of Portland cement or lime or a combination of both, sand, and water used to bind bricks, stones, and concrete masonry units together.